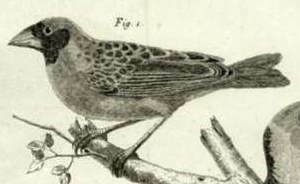 Linnaeus 1758 described the quelea with a Latin text, but did not provide a reference. He noted that the species came from India, again an error based on ships from the East Indies picking up bird specimens along the African coast on their return to Europe. In his updated 12th edition of Systema Naturae (Linnaeus 1766), he presented the same plumage description in Latin but corrected the type locality to Africa, and listed Brisson as a reference. Presumably Linnaeus had access to Brisson's 1760 draft in 1758. Mathurin Jacques Brisson, a French zoologist, wrote his book on birds in several volumes, each page having 2 columns (one in French and one in Latin). For the quelea, Brisson gave the names "Le Moineau a bec rouge du Senegal" (French) and Passer senegalensis erythrorynchos (Latin). Brisson noted that the quelea originated from Senegal, from where it had been sent to RAF de Reaumur in France by Michel Adanson (the generic name of the Baobab, ie Adansonia, was named after Adanson). Brisson's book has a few engraved illustrations by Francois-Nicolas Martinet, including one of the quelea. 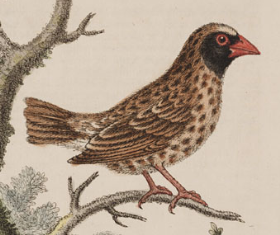 Edwards 1760 also illustrated the Red-billed Quelea (in colour) in the same year as Brisson. George Edwards called it the Brazilian Sparrow, not being sure if it came from Brazil or Angola. The painting by Edwards was based on a living male in the collection of Mrs Clayton in England, being a different individual to the type specimen. Linnaeus described many or most of the birds in Edwards, but does not seem to have used the quelea in Edwards (at least not under Linnaeus' genera Loxia or Emberiza). quelea and the quails of the Old Testament were both found in enormous flocks. both quail and quelea have similar streaked upperparts and buzzing flight. from quell or to quail meaning "to torment", referring to the destruction of crops by quelea. 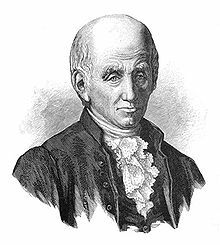 Michel Adanson, a French naturalist who undertook a collecting expedition to Senegal. Between 1748-1754, the time that Adanson spent in Senegal. No type specimens known to survive, but the painting of Brisson serves as a type. Identification The Red-billed Quelea male in breeding plumage (photo left) has a mask with no pink or varying amounts of pink around the mask. The mask is usually black but is white in some males (see more photos of head plumage variation here). This variation is to allow individuals to recognise each other. In the non-breeding season the sexes are alike, with a dull brown plumage, and a red bill, eye-rings and legs (photo right). 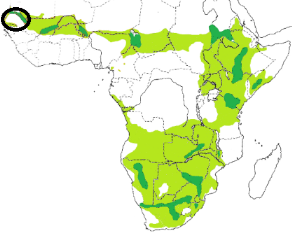 Q. q. lathamii in the southern third of Africa. 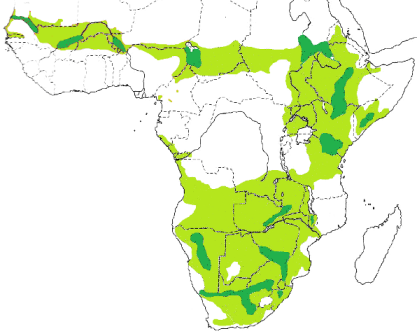 The map (left) shows the distribution of the Red-billed Quelea - the darker green shows areas of high breeding effort. Habitat The Red-billed Quelea may occur in very wet and very dry areas, but is most abundant in semi-arid habitats. In West Africa it is concentrated in the Sahel zone. In East Africa the Red-billed Quelea commonly occurs in bushed grassland and cultivated areas. In southern Africa it prefers breeding in dry thornveld. The Red-billed Quelea occurs commonly in farmland, especially in cereal fields. Food The Red-billed Quelea feeds mainly on seeds, typically about 2 x 1 mm in size, but also eats insects and spiders. It feeds on seeds of natural grasses, and damages crops of wheat, sorghum, manna, millet, oats, buckwheat and rice. Breeding The Red-billed Quelea is monogamous and breeds in small to vast colonies - in contrast, most monogamous weavers breed as pairs or in small groups. The nest of the Red-billed Quelea is a small oval ball of grass, with a side entrance at the top under a small porch. Only green, flexible grass is used to build the nest, using about 600-700 grass strips. Nest building is completed in 2-3 days. Nests are built mainly in thornbush with complete grass cover and 20-50% tree cover; using mainly Acacias but also other savanna trees. Colonies may also occur in reeds. The Red-billed Quelea has one of the shortest breeding cycles of any bird. The breeding cycle takes about seven weeks: nest construction and egg laying overlap and are completed in six days; incubation lasts 910 days; the nestling period takes 1113 days; chicks fledge at age 16 days and start self-feeding at 19 days, and are independent fledglings about a day or two later.